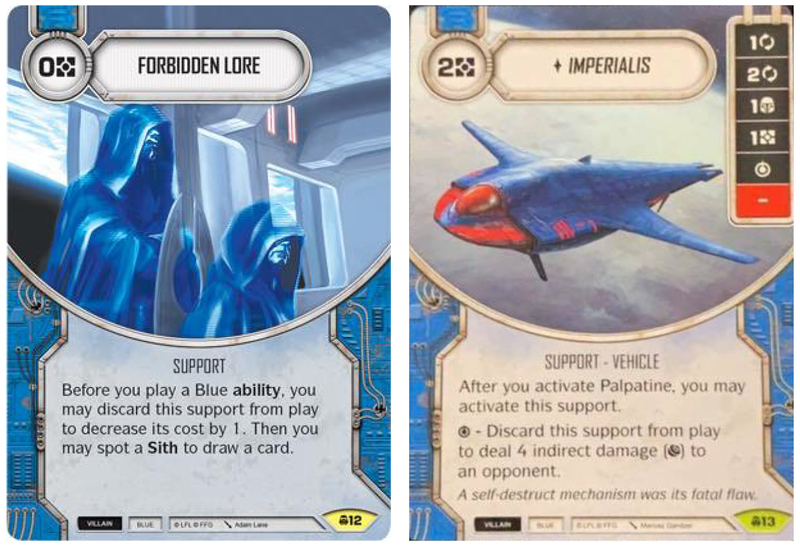 We have become accustomed to Blue villains being spoiled in various expansion sets, and while they did receive what is likely to become the marquee character of the set: Palpatine, the set does not - at least at a glance - look to have been too kind on the them! There are only few cards, if any at all, that look outstanding and I haven't given any blue villain card a top grade! There's still plenty of time to get deep into the set, but as it is there's not much to point towards the Sith Lords dominating the Convergence era! Talk about being upgraded to life in a new age! ASAJJ VENTRESS is back with a vengeance! The previous version of Asajj Ventress was as close to unplayable as possible, whereas there is all kinds of reasons to love the new Asajj's. Coming in at 13/16e points, I can even live with her 3 Melee payside! And she has 12 HEALTH!! Her die is of course the most comparable to her hero counterpart Kit Fisto, whom I originally rated at (3/5) in the Across the Galaxy Set Review we did some months back, and while that would be the reasonable rating for Asajj Ventress - Swift and Cunning as well, I'm going on a limb here by rating her a tad higher. She slots in beautifully with a number of great sidekicks and could be looking to replace Kylo Ren as Snoke's great partner-in-crime, and does feel superior to Kylo in all respects, but the impact against monocoloured teams. Asajj has great die sides just waiting to be Power Action'ed by Snoke, and I like the 1 Discard side much better than Kylo's 1 Disrupt side. She could also team up with Savage Opress for some crazy Melee damage action! It's difficult to say if Asajj's ability is going to make a difference. I'd probably not build a deck around Downgrades, but it definitely makes that design space a viable option for tech'ing in a few cards, i.e. Wounded or Shock Collar. She's already pretty playable as is, whether or not you include Downgrades, and looks like one of the good characters of the set. 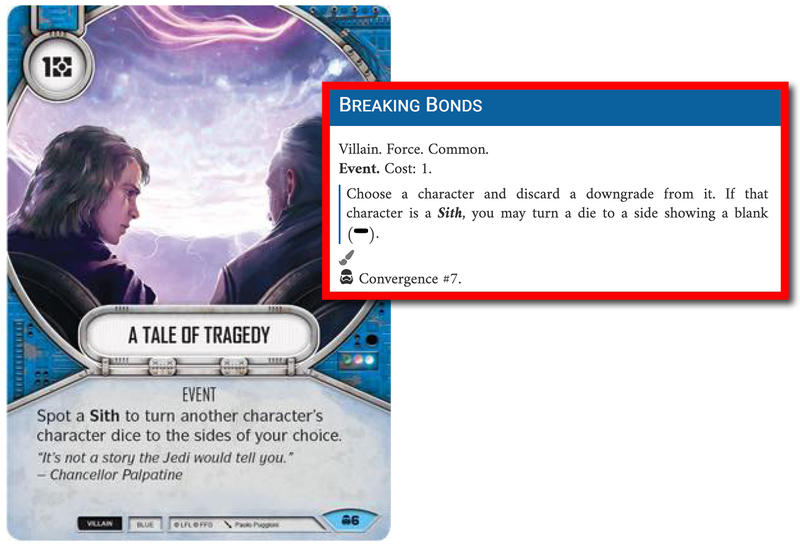 There's no doubt that PALPATINE - UNLIMITED POWER is going to be one of the most sought after legendaries of the entire Convergence expansion, no matter what... He's one of the most iconic characters in Star Wars, maybe only outshone by Darth Vader ... that's that. 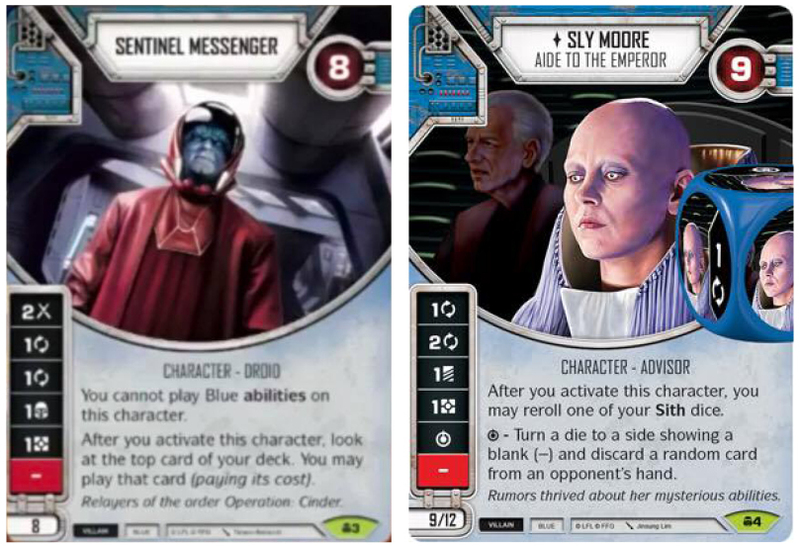 I love the design of Palpatine and it is unique in the way that he interacts with your deck and is modified accordingly. Coming in at 14/18e points, he has a very strong die and gains power as you start upgrading him with Abilities. He also gets weaker as abilities are removed from him, so a Vandalize will not only strip him of an upgrade, but also potentially deal damage. There are some interesting interactions in place here. I'm also happy to see that the design team resisted the temptation to give him a 2 Resource side! There ceiling for Palpatine is fairly high in Infinite Format, but the floor much lower in Standard Format and I feel he's slightly overcosted. The SENTINEL MESSENGER takes up the same character slot as previously filled by the Servant of the Dark Side, who hasn't seen a lot of play, but arguably stronger with the Sentinel's passive ability being extremely powerful! The Sentinel Messenger slots in beautifully with Palpatine - Unlimited Power, sharing both damage sides (Melee) as well as adding consistency with two Focus sides. His 8points cost is perfect for a single die Palpatine leaving just enough space for another 8point character (still just 3dice, but potentially a sh*tload of health). So, she's obviously made to slot in nicely with Palpatine3 for some monoblue elite action. And as every support character these days, she's overloaded with Focus sides! We really need to start evaluating support characters differently as everybody and their cousins has several Focus sides these days. Her ability is ok as it brings plenty of consistency to her Sith partners while her Special is actually really good - both Blanking a die and Discarding a card from hand, making it even harder to fix your dice after she has manipulated them. I kinda have the feeling that her points cost makes her difficult to fit into quite a lot of decks, which could be prohibitive for her seing regular play. I'm super torn over Downgrades. 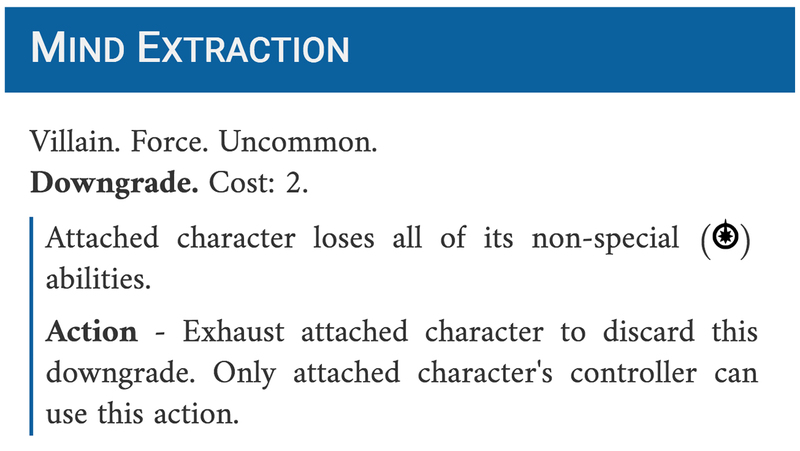 If Mind Extraction also affected Special-abilities it'd definitely be much stronger and deserve a higher rating, I guess Yoda dodged another bullet there, but for 2 resources it's pretty expensive. I'm assuming here that the wording implies that it is intended to affect all abilities, not just action-abilities. I'm sure it'll see play, but not sure it will be widespread in a competitive field. Our new batch of mitigation cards seem to embrace the design of "types" much more, which means that those mitigation cards will immediately be good in Trilogy format, much weaker in Infinite and have limited application in Standard. A Tale of Tragedy requires spotting a Sith, giving it incredibly limited application due to the low number of Siths currently available. It is better than its hero counterpart Concentrate and/or Alter (neutral) though. It earns its fairly high rating due to the flexibility of it, being able to target your own OR an opponent's character dice. In a vacuum, Fit of Rage is incredibly strong and if it hits its ceiling it represents out of this world value, i.e. removing 3 Shields on each of 4 characters. That's of course never going to happen, and you are more likely to removing 3-4 Shields in which case Frighten is a better alternative. Heroes look like they are going all in on Shield generation, which in turn means that Shield hate cards should be strong. Fit of Rage is likely to be the weakest of those Shield hate cards. Free mitigation is always good and while both Doubt and Hidden Motive have been extremely popular since their release (and re-release of Doubt), they've always been quite volatile, and Forsaken seeks to offer more stable mitigation. It's the most powerful in the beginning and the end of a round where the dice are the fewest in the pool, and can be rendered completely useless if your opponent gets the sequencing right. 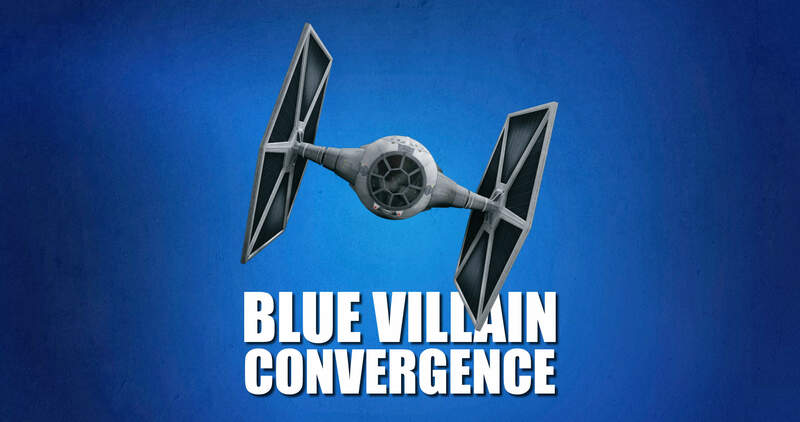 I'm still confident it will see plenty of play and looks like a very strong event for blue villains. Good old Awakenings-reprint and for a long time a staple in monoblue decks. It kinda vanished for a while, but with some of the all-time favourites rotating out of Standard, i.e. Overconfidence and Force Illusion, we are likely to see a huge resurgence of Isolations again. It's very strong against Yoda and Snoke based decks. "Hello No Mercy my old friend, I'm here to talk to you again" ... I love No Mercy, and I think many blue villain players will be happy to see it reprinted. It has always been good to finish off characters and will continue to be so. Forbidden Lore has a narrow application compared to its predecessor It Binds All Things, but is actually much better! It's REALLY GOOD in decks that focus on ability upgrades, i.e. 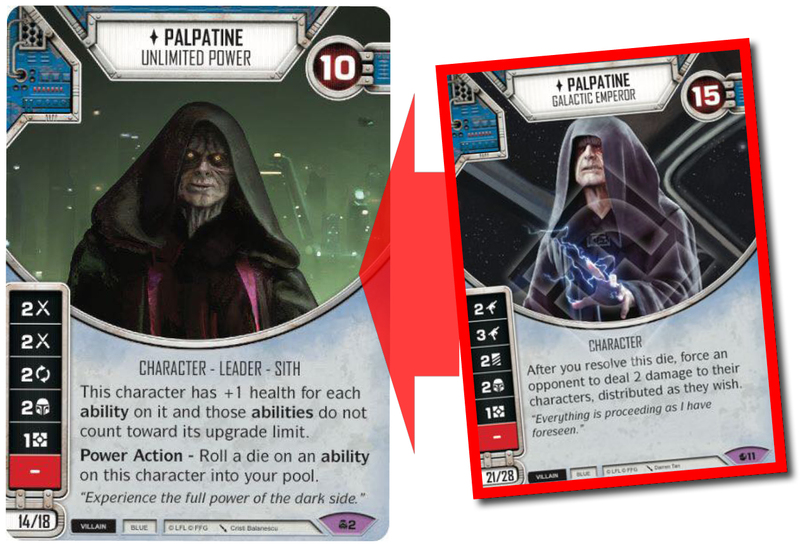 Palpatine decks, as it doesn't only give you a discount similar to Luke's Training, but also replaces itself when used as long as you spot at Sith. It will not see a whole lot of play due to its many restrictions, but will be vital in a few decks. Its power level will be intrinsically linked with the power level of Palpatine. Imperialis provides very cheap Focus sides as well as speed when played with Palpatine. That synergy is not necessarily the best and MUCH WEAKER than what Padmé got from her Royal Starship! I like the Special and think it can be much stronger than what I at first was willing to give it credit for! The Force Storm die is actually pretty ridiculous! Huge sides and all of them good. The thing is that when you invest 4 resources into any upgrade or support you are looking to reap the benefits every round, which in turn means that both the 2 Shield and 2 Discard sides are probably not want you want to see. The Special is really powerful at a glance and definitely the side you want to see on your initial roll, and if you can hit the Special several times (or focus it) it can be EXTREMELY powerful with an insane ceiling. In decks that are flush with focuses, Force Storm might mandate a higher rating, but in a vacuum, I'd be hard pressed to recommend it over a card like Vader's Fist, even if the Force Storm can be played at a discount with Forbidden Lore. In Infinite where you have access to Sith Holocrons it's crazy good. One of the cheap ability upgrades meant to push the stock of Palpatine. It's rare to see Redeploy on a 1cost upgrade, which might raise its stock a bit, but still not much though. The die is pretty bad and the Special probably not worth more than 1-2 damage. 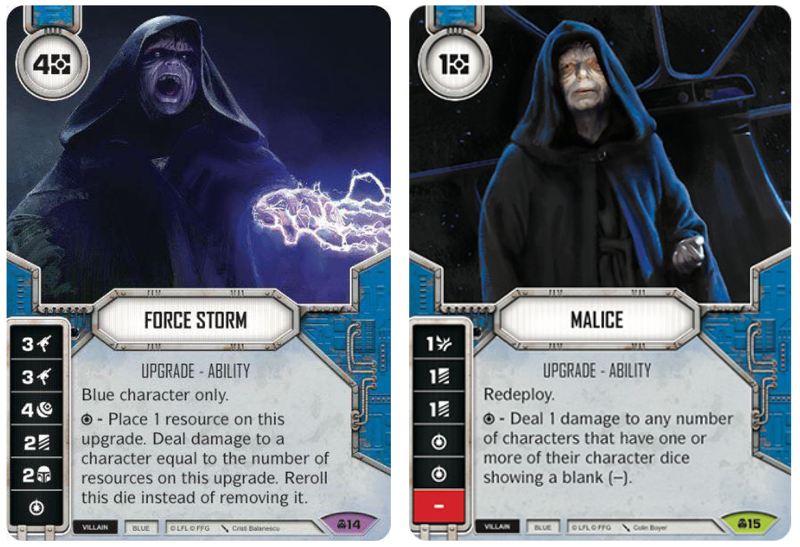 Malice will be good on Palpatine, which is what it was designed for, but won't do much outside of that character team or maybe as a one-off in a x/Talzin lineup?! It has the same effect when attached to Palpatine as Rex's Blaster Pistol on Captain Rex, and it's going to be interesting to see if FFG decides to pursue this for more unique upgrades or if it is just for thematic flavour - I'm assuming the latter. 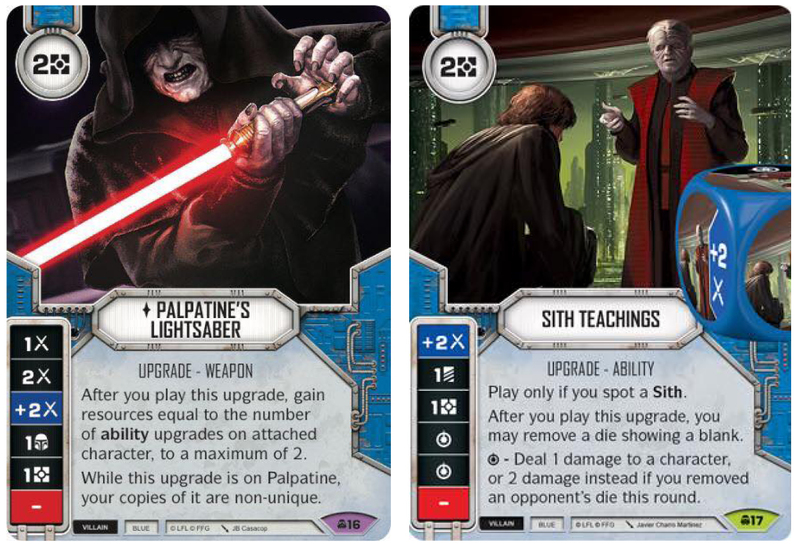 If there are more cheap ability upgrades in upcoming sets, Palpatine's Lightsaber might deserve a higher rating because the play ability is pretty good (and is probably earning a 4-5/5 rating in Palpatine decks)! Being able to potentially play it for free is massive, but I'd include it nonetheless in blue melee decks! It adds nicely to the line of blue 2cost lightsabers with decent damage sides, marginally better than previous favourites such as Ancient Lightsaber and Shoto Lightsaber, so should definitely see plenty of play. The ceiling is okay for the Special, but if you just manage to deal the 1 damage, then it's pretty bad. It really like the thematic feel of it, but that's not going to help it in a competitive environment. I'm rating it at 2/5, but as more cards enter the pool for standard constructed format, it'll get worse (hopefully).